Little is a reverse take on the classic Tom Hanks '80s film, Big. The reimagined plot has a mean and domineering adult woman magically de-aged into her nerdy thirteen-year-old body. The film is quite silly and not remotely in Big's league. But does have laugh out loud moments and great chemistry from its African American, female lead cast. 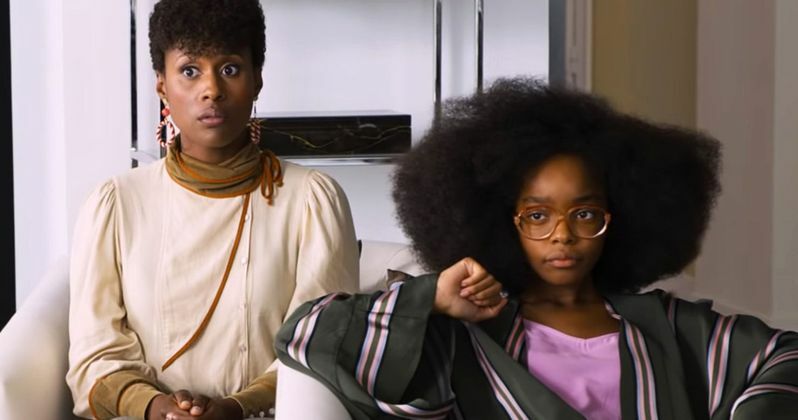 Teen actress Marsai Martin, who also served as an executive producer, delivers a star-making performance. Issa Rae co-stars as April, Jordan's insecure personal assistant who bears the brunt of her acerbity. She watches as Jordan gets into a shouting match with the child of a doughnut truck owner. The following day, Jordan wakes up inexplicably in her teenage body. Young Jordan (Marsai Martin) remembers the bullying and meanness she experienced growing up. She's forced to revisit a childhood that molded her sour outlook. Regina Hall, Issa Rae, and Marsai Martin are hilarious. They prop up Little with likeability every time the script begins to fade. Their characters are well defined in a fairly simple story. The young and old Jordan struts around barking orders like a drill sergeant. Regina Hall gets a lot of laughs humiliating her staff at work. Turnabout is fair play as the exact opposite happens to Marsai Martin when she's forced to attend middle school. Jordan's power over others fizzles as she becomes the target of bullies once more. Issa Rae is stuck tending to her boss turned teenager. Her sharp comic timing and bewildered facial expressions are the perfect counterpart to the Jordans. Little is utterly predictable. I would have been bored senseless if not for the sprinkled humor and charismatic stars. Tina Gordon needed more heft to the script. It's too straightforward. Moments that are meant to be heartwarming fail to resonate. The film is obviously meant to be raunchy and slapstick, but had the opportunity to be somewhat insightful. Little copies the premise of Big, but fails to be substantive in any way. Watch Little for its cast, especially Marsai Martin. She gives a breakthrough performance here. Martin is well known from her role on the ABC hit sitcom Blackish. I've never seen the show, but was impressed by her talent. Martin certainly has a bright future. Little is distributed by Universal Pictures and will open in limited release Friday, April 12th.